PMC has just announced their next generation MB3 and BB6 active studio monitors at NAMM 2017. The new MB3 and BB6 are ultra-high-resolution active monitors with digital and analogue inputs, designed for freestanding or soffit-mounted use in recording, mixing, mastering and outside broadcast applications, and available as single- or twin-cabinet (XBD) versions. Both marry the effortlessly extended low-frequency response, wide dynamic range, non-fatiguing sound and extreme tonal accuracy and consistency of PMC's groundbreaking ATL™(Advanced Transmission Line) designs with the power of the proprietary Class-D amplification first unveiled on the QB1-A main studio monitor, and subsequently installed in renowned international facilities including Hollywood's Capitol Studios. Precision tools designed by engineers for engineers, the MB3 and BB6 combine these market-leading attributes with the latest generation of PMC's industry-leading drivers and intelligently applied cutting-edge DSP, in cabinet designs re-engineered to further improve imaging and dispersion. 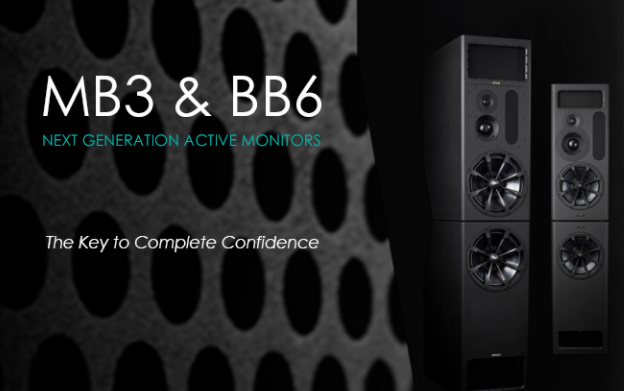 PMC's MB3 and BB6 are build on the design of their internationally respected MB2 and BB5 monitors. These new models feature PMC's hand-built, precision-matched 34mm soft-dome tweeter and legendary 75mm fabric mid-range driver coupled with the latest generation of the Radial™ low-frequency driver, built specifically for use with PMC's ATL™ designs. The MB3 features a 12-inch and the BB6 a 15-inch Radial driver; teamed with the ATL, these exhibit a flat response down to 20Hz and 17Hz respectively. The LF drivers are engineered with an exposed exoskeleton to dissipate unwanted heat, thereby eliminating the detrimental effects of power compression — so they can be driven for extended periods at high output levels while preserving definition, and without exhibiting tonal changes or distortion. Both the MB3 and BB6 are available as single-cabinet (MB3-A and BB6-A) and twin-cabinet (MB3 XBD-A and BB6 XBD-A) active versions. The latter provide an ultra-smooth in-room response and offer 3dB more headroom (the MB3 XBD-A has a maximum SPL of 129dB, while the BB6 XBD-A will produce a massive 131dB). Dedicated centre-channel versions of the MB3 and BB6 are available for multi-channel systems, but subwoofers are not required, as the 20-60Hz sub-bass frequency range is already comprehensively covered. Instead, all the new systems incorporate dedicated ‘Point One’ inputs to accommodate the LFE channel from surround mixes, such as the effects channel in film soundtracks. Powerful amplification partners the new loudspeakers’ robust, precision drivers. PMC's Control 1200 and Power 2400 Class-D amplifiers ensure that there will always be ample headroom, no matter what demands are placed on them. Each channel of the new MB3-A, MB3 XBD-A and BB6-A is powered by a single Control 1200 (supplying 275W of power to the high-frequency driver and 550W to the mid-range unit) and a Power 2400 unit, which, as its name suggests, supplies 2400W to the bass driver (and to the XBD unit on the MB3 XBD-A). The exception is the BB6 XBD-A, which has an additional Power 2400 dedicated exclusively to the 15-inch bass driver in the XBD cabinet for the ultimate in control, headroom and bass definition — a total of 5625W of power per channel. As with PMC's QB1-A Main Monitor, both the MB3 and BB6 incorporate advanced DSP which is employed here to finesse what is already an extremely well-engineered design. The DSP optimizes the response of the drivers, maximizing their dispersion, guarantees a flawless 24dB-per-octave crossover, and provides non-invasive protection using modeled excursion limiting. The DSP also provides shelving EQ for in-room integration, along with four presets, which are ideal for personal settings when multiple users have access to the system or if a particular custom balance is required. These can be accessed via a wired RJ45 desktop remote control with a backlit display and jog wheel, which is supplied as standard with all the new models. The remote also allows input switching and shelving EQ adjustments to be made from the listening position without the need to constantly refer to the rear panel of the monitors. PMC's cabinets used play integral roles in the high performance of the MB3 and BB6; aside from incorporating the Advanced Transmission Line itself, the construction of the enclosure must be of a high standard to eradicate colouration and audible cabinet talk. Highly braced, resonance-damped Medite® is used with offset HF and MF drivers, radiused edges and acoustically absorbent StealthBaffles™ at the boundaries, as employed in the QB1-A design, to minimize edge diffraction effects. Every detail is formulated with the aid of pioneering acoustic research and measurements undertaken by PMC in anechoic environments at the UK's National Physical Laboratory, using opto-acoustic laser interferometry to map the soundfield and acoustic dispersion. “All of our reference monitors have to satisfy these important criteria," explains Oliver Thomas, Head of Design at PMC. "They're precision tools which are relied on in all analytical audio applications, and we truly believe that they allow everyone to work faster, better, and with complete confidence. But these technical aspects, their high resolution and complete neutrality also ensure that all the emotion of a performance is translated to the listener. So these are loudspeakers for the heart and mind. They offer supreme tonal accuracy, detail and translatability, but also musicality and the power to move you — physically and emotionally." RSPE will be the first place after NAMM you can hear the MB3 and BB6 Speakers for yourself. Call or Live Chat with an RSPE Specialist to make ann appointment.